Chicken. Bacon. Ranch. These three things were made for each other. Individually they are nice. Together they are PHENOMENAL. What is it about chicken, bacon, and ranch that just mesh so well? Everyone (sans vegetarians) loves this combo. It’s really not fair to other foods. Once you put the holy trinity of chicken, bacon, and ranch on something, it outshines all others. These quesadillas are no exception. Even though it’s not anything special or unusual, it’s still ridiculously delicious. These could be very versatile. Cut them into small triangles and serve as an appetizer or a snack. Eat it by itself as a lunch. 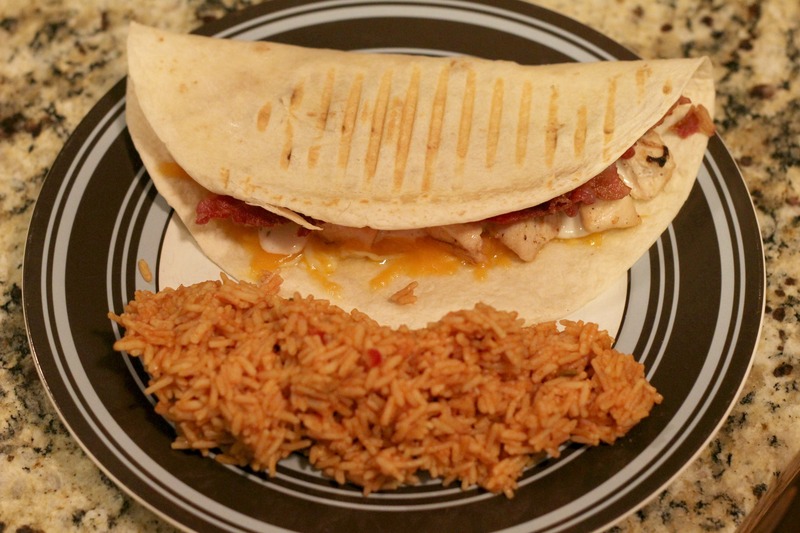 Or put some Spanish rice and a salad on the side, and you’ve got yourself a filling dinner! Plus this is really really easy to make. Perfect for a quick, easy meal. If you have a panini press, turn it on. If you don’t have a panini press, heat a medium skillet over medium heat. Spray pan with cooking spray. Lay tortilla on a flat surface. Cover the tortilla with an even layer of cheese. Top one half of tortilla with chicken, bacon and mushrooms. Drizzle Ranch dressing over chicken. If using panini press, fold over tortilla, spray both sides with cooking spray and place in the panini press until cheese is melted and bubbly. If using skillet: Place tortilla in skillet. Cook for 1 minute, until cheese starts to melt. 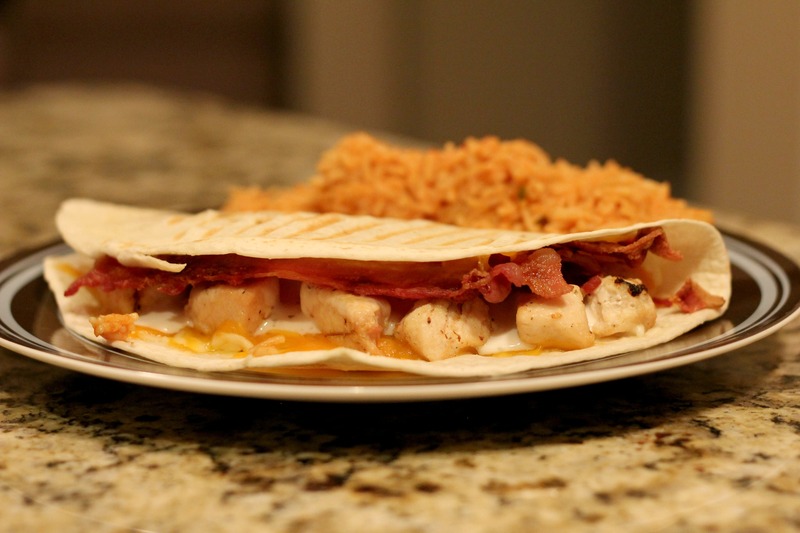 Fold in half – cheese side of tortilla over on chicken. Cook for 2 minutes more, flipping until each side is golden and crisp.